If you want to visit an otherworldly place, you need go no farther than Japan, home of high-tech toilets, birthplace of all the electronics fads that engulf the rest of the world a few months later, and source of cool automobiles including the baroque Toyota pictured by Joe Polevoi in the image on the opposite page. I read somewhere that the reason that Japanese cars are festooned with so many name badges, bits of chrome trim, and other doodads is that, in their crowded urban areas, being able to observe an entire vehicle at one glance may be rather rare. So their cars are given distinctive trim that makes it easy to divine which model you're looking at even if you can glimpse only a fender or tail light as it zips past. Of course, someone may have been pulling my leg, as Joe Polevoi was eager to do with this image that he calls "Toyota Alien." He noticed that, from certain angles, a particular Toyota model had an otherworldly appearance. 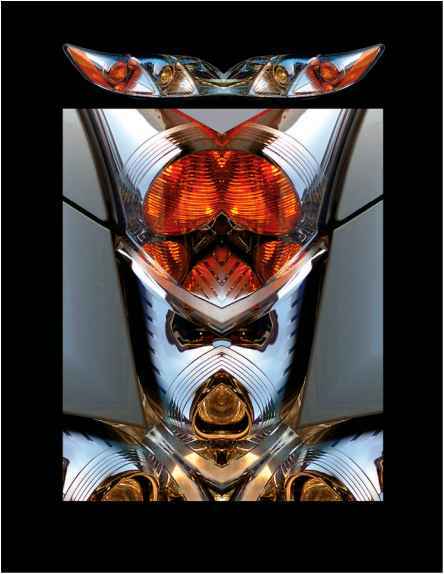 "I used mirror images of various parts of the car to create a kaleidoscope-like version that emphasized that alien look." Those of us in the Cleveland Photographic Society who have been subjected to Joe's strange visions in the past have started to wonder exactly what planet he came from.